Note: I have a Summer Goals blog post from last year that you may also want to check out. - Read at least two books. - Get a henna tattoo. - Attend more blogginging events. - Save up some money. - Go on a picnic. - Eat healthier and drink lots more water. - Stop stressing about little things. - Get our home sorted out more. - Get Daisy into a doggy school. - Have a beach trip. - Spend more time with my friends. - Have a water fight. - Donate food to an animal shelter. - Make my own bird house for our tree. - Go to an arcade. - Have Phil make me breakfast in bed. - Have a fantastic #LPPevent!! - Have an awesome birthday!! 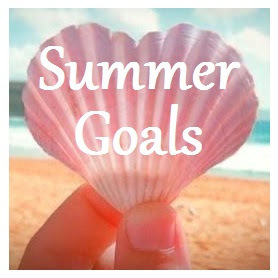 If you have a summer goals list then please tweet it to me so I can read it! I hope you all enjoyed today's blog post and have a amazing summer time this year and a wonderful day! This was such a lovely bucket list! I would love to get a henna tattoo as well, great post lovely!